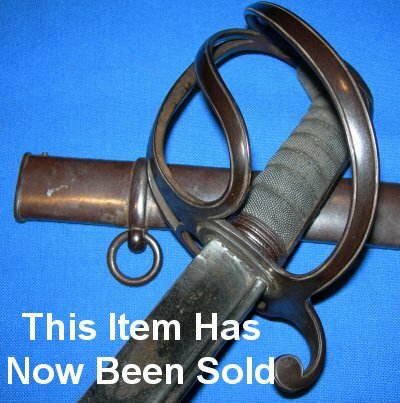 In very good condition, a George 4th British light cavalry officer's pipe backed sword / sabre. These are incredibly hard swords to find in such good condition. The impressive 35 1/2 inch blade with tablet form George IV cypher etching both sides is in very good condition, a little sheathing / drawing scuffing near the ricasso, nothing much, the tip area still sharp, the blade firm in the hilt. The lovely wide flared 3 bar hilt is also in very good condition. The fishskin grip and associated twisted grip wire bindings are aged and worn a little, but generally very good. 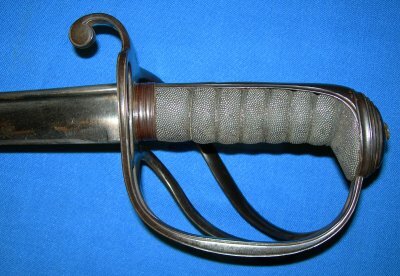 The steel scabbard is also exceptionally good for its age; it appears to be original browning rather than patina; there are some very small pitting spots but the scabbard is well above average. The sword sheathes and draws well enough; it is a little loose, so the original wooden linings have eroded as is to be expected.